Those who choose to work in human services are often well-equipped, not only to do their jobs, but to do their jobs well. Those in power endeavour to provide them with frameworks, procedures, infrastructure, leadership, professional development, teams and resources intended to support them in their support of others. As well, a human service worker usually has the internal resources that make them the best person for the job at hand, whether it be through personal experience of the issues they help others with, their world view or deep-seated values and beliefs about people’s rights, strengths and capacities. While implementation of human services programs will always remain contentious (such as staffing and funding levels, changing social policy), the overall aim is to ensure that the right people have the right resources to do the right job. They need these resources too (whether they be externally provided or internally sourced) for the job at hand can be stressful, confronting and emotionally charged. Human services workers can find themselves working with people who are at turning points in their lives—young people leaving care, children moving into foster care or people experiencing a mental illness or family violence, losing a job or ending a relationship. How is it then—even in those cases where staffing levels are ok, where training needs are observed and provided, where buildings and office spaces are purpose built, where everyone has the latest IT and equipment, where one-on-one supervision is offered—high attrition rates, stress, burnout and vicarious trauma still exist? ‘Physician heal thyself’ has long been a mantra for anyone working in the ‘people industries’. We know that as much attention must be paid to looking after ourselves as is paid to supporting others. We also know the value of overt ‘parallel practice’ and that we must apply the same principles of practice (respecting rights to self-determination, using and demonstrating empathy) as much to our organisations as to the people our organisations support. If we ask someone to take care of themselves, we should do that too. Consequently, and thankfully, worker self-care is not a new concept in human services. Workers are often asked how they are ‘going’, encouraged to take a break or leave the office for a while. It is no longer so strange when someone says they took a ‘mental health day off’. Self-care even manages to sneak onto supervision agendas, down there … at the bottom … if there is time. In my role as a practice development coach and trainer in strengths-based practice, and particularly when it comes to a strengths approach to supervision, I meet with teams of workers from organisations across the country. It is fair to say that even where organisations have strong team cultures and strong supervision practices, self-care is usually given short shrift. I’ll often ask if anyone has a formal self-care plan or has attended any self-care training. Usually the answer is, ‘No’. 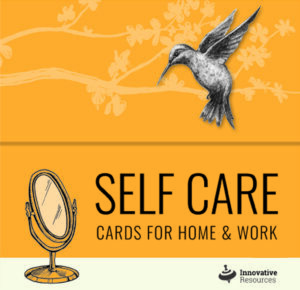 Plenty of informal self-care plans exist and when I ask what is included in them, the answers usually relate to taking a break, using annual leave, attending gyms, having a bath after getting home, going for a walk, having a glass (or two) of wine or catching up with friends. We can think also of the need for rest, sleep, using the right medications, getting out into nature, relaxation, eating and drinking what helps, as part of a self-care plan. While all of these are very important, and can be valid self-care strategies, I would argue that they alone will do little to lower the incidences of stress, burnout, compassion fatigue or vicarious trauma that are so prevalent in the human services industry. This is because each of these strategies sits ‘outside’ of the work we do. 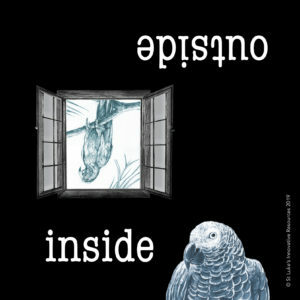 Real, effective, self-care plans need to look ‘inside’ the work we do. They need to include strategies that relate to the work being done and the people who are doing it, such as a commitment to reflective practice. Just as vicarious trauma can be a ‘transformative’ experience, where we are ‘changed’, usually for the worst, by our experience of the problems faced by the people we support (Saakvitne & Pearlman,1996), we need to see how an experience of work can be also be transformative in a way that benefits us and helps us cope. We can explore what work might do for us, how it gives us meaning, how it is supported by, strengthens and affirms our values and beliefs, what we share with others and how it fulfils our sense of community. In this way, when formulating a self-care plan, as well as thinking about non-work related activities, we need to also ask ourselves questions that focus more on how practice itself can be the basis of what serves us to be able to cope with what we see, hear and feel every day. Who or what gives me energy? Who energises me? What purpose does my work serve for me? How does my work enrich my life or that of others? How do I feel when I reflect upon my practice? What benefit is there in having conversations on practice with others? Have I got enough space for reflecting on practice in my working day? What work habits support me? Do I have enough time to celebrate successes within my work? Where do I find meaning within my work? How does my workplace culture contribute to my well-being? What am I curious about? What more do I need to learn? The more we associate self-care purely with non-work related activities the more we will see work as uniquely a contributor to stress, burnout and even vicarious trauma. Finding self-care strategies within our work enables us to focus less on creating conscious or unconscious boundaries between work and us, and more on creating meaningful connections between our practice and our well-being. Saakvitne, K. W., & Pearlman, L. A. and the Staff of the Traumatic Stress Institute (1996). Transforming the pain: A workbook on vicarious traumatization. London. New York: W. W. Norton. I am interested to know the price of the Pocket of Stones. Can I buy the bag of stones and the book only or does it come only as a package. Each can be purchased separately or as a bundle. Oh this really hits the nail on the head! Andrew you have spelled out such important questions for reflective practice. In my own practice (and with people I work with in human services), it is so important to create time, space & action (often using a metaphor) in our day to help ‘let go’ or ‘be with’ that sustains our work with others. Thank you. These cards will be on my wish list.